HENRY PRIESTLEY. There were Priestleys in the Forest of Rossendale in the early 16th century. 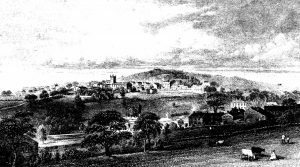 Robert Priestley and his son John were living at Constable Lee, to the north of Rawtenstall. Robert appears frequently in the court rolls of the manor of Accrington as defendant or plaintiff in cases of affray. There is a Priestley Clough near Accrington. There is a gap of more than a century between the Priestleys of Constable Lee and the first definite evidence of our own Priestley family . Newchurch consisted of the village of Newchurch between Rawtenstall and Bacup, the hamlets of Deadwin-Clough, Tunstead, and Wolfenden, and part of Bacup. There is Priestley Fold Farm further up the Whitewell Brook near Water. The historian Jennie Nuttall was unable to find the origin of the name. We are tempted to think that early Priestleys were living there, but an archaeological survey concluded that it was a late 17th-century settlement with a laithe house (farmhouse and barn) and a weaver’s cottage. In 1507 King Henry VII decreed that Rossendale should be deforested, which means opened up for habitation and cultivation. The first church was built in what is now Newchurch in 1511. Previously, the inhabitants had had to make a difficult 12 mile journey to their parish church in Clitheroe, which was serviced by the monks of Whalley. It is from this that the place received its name of Newchurch. It was earlier known as Kirk, which means “church”. This church, believed to be of wood, was the first place of worship to be built in the Forest of Rossendale. It was dedicated as the Chapel of Our Saviour in Rossendale. The deforestation of Rossendale led to an increase in population as the area was opened up to settlement. The church was rebuilt in stone in 1561 in the reign of Queen Elizabeth I, and re-dedicated to the Holy Trinity – the octagonal stone columns with splayed caps within the church are thought to date from this time. A consecration stone in the porch bears the initials of Elizabeth I, dated 1561 with the Royal Arms of England including the French fleur-de-lys. The present church was opened in 1826 and dedicated to St Nicholas. We do not know whether the Priestleys played in the building and maintaining of this early church. We first meet them in the parish register a century later. 1641/2 Feb 27 Marie, daughter of Henericus Priestley of Deadwinclough. Deadwin Clough is a hamlet on the River Irwell, west of the church. It derived its name from dedequenclough, ‘the clough of the dead woman’, recorded as early a 1324. Marie’s baptism was just before the outbreak of the Civil War between King Charles I and Parliament. It was at this time that the Protestation Returns of 1641/42 required every English male over the age of 18 to take an oath of allegiance “to live and die for the true Protestant religion, the liberties and rights of subjects and the privilege of Parliaments”. A handful of people refused. The House of Lords has made available scans of the original handwritten returns. Since he had a child baptised in early 1642, we should expect to find this Henry Priestley of Deadwinclough in the Protestation Return for Newchurch in Rossendale, but we have not found any Priestleys. In the section for Deadwin Clough, however, there are Robert and Henry Hey. In the 1670s we find the surname Priestley alias Hey. If the older Henry shared this alias, it is possible that he was recorded in the baptism register as Priestley and in the Protestation Return as Hey. This remains conjecture. We have found no record of Robert Hey’s wife or his burial. The early registers for Newchurch are incomplete. He may be the father of Henry Hey. There is similar uncertainty about Henry of Deadwinclough’s wife. The baptism register at this time does not name the mother, and the number of Henry Priestleys makes it difficult to interpret the burial register. We have not found a Priestley marriage earlier than that of Henry Priestley alias Hey to Ann Baxenden in 1677. There are two burials which could be that of the older Henry’s wife, and one which is probably Henry himself. 1674 Dec 6 Ann, wife of Henry Preestley. 1675/6 Feb 28 Henry Preestley. 1675/6 Mar 20 Ellin, wife of Henry Preestley. Those of Henry and Ellin are so close together that we are tempted to think of them as a couple who died of an infectious disease. But “wife of” suggests that her husband was still alive when Ellin died. If this is so, then it is probable that Ann is the wife of Henry Priestley of Deadwinclough. We cannot be sure of the connection between Henry Priestley of Deadwinclough, who possibly had the alias Hey, and the earliest known record of our Priestleys which is in 1663. This is 23 years after Marie’s baptism, so almost certainly a generation later. Our immediate impulse is to assume that George’s father is the son of Henry Priestley of Deadwinclough. There is, however, a complication. Four months after George’s baptism we have the baptism of Henry, son of Henry Priestley. It would appear that there were two Henry Priestleys raising a family in Newchurch in the 1660s. We can assume that one of them was the son of Henry of Deadwinclough, but we do not know which. The baptism register sometimes yields an address. One of the two Henrys was Henry Priestley of Whitewell Bottom, a small settlement on the Whitewell Brook, a little way north of its confluence with the River Irwell at Waterfoot. It is likely that this Henry is George’s father. We have no certain address for the other Henry of this generation, but he was probably living in Newchurch. This would place him nearer to Deadwinclough, which included part of Newchurch, and so marginally more likely to be the older Henry’s son. But the distance to Whitewell Bottom is only just over a mile, so the evidence is far from conclusive. A further possibility is that Henry of Deadwinclough continued to have children more than twenty years after the birth of Marie. The Newchurch registers date from 1616, but have only survived in fragmentary form. Marie’s baptism is the only entry we have for the Priestleys in the first half of the century. It is likely that there were other siblings and that one of them was baptised Henry. We also find James Priestley having children baptised in the 1660s. He may well be another of Henry’s children. Sometimes High Church priests were ejected from their livings after the Civil War, and replaced by more firmly Protestant ministers. We do not know if this was the case in Newchurch. If we are right in speculating that Robert and Henry Hey in the Protestation Return may be Priestley alias Hey, then Robert Hey is another possible father for one of the Henry Priestleys of the 1660s. It was common for the registers to record only one half of an alias. Alternatively, one Henry may have come to Newchurch from another parish. Around this time we find Henry Priestleys in the parish of Padiham, 8 miles away, north of the Forest of Rossendale. The older Henry Priestley’s burial is probably that on 28 Feb 1675/6, just over a year after the death of Ann. Lancashire Church Surveys, 1650, (prepared for the Record Society of Lancashire and Cheshire 1879).